Tunes I love these playlists by The Effortless Chic. Homemade Pizza Impromptu parties like these are a perfect example of why you should always have pizza dough in your freezer. Always. I love "make your own" pizza night for a group because everyone gets involved and it's so much fun. Here are Martha's 47 homemade pizza combinations if you need some ideas. Ambience No fireplace? Fake it! We have this DVD and love to play it in the background in the winter months. 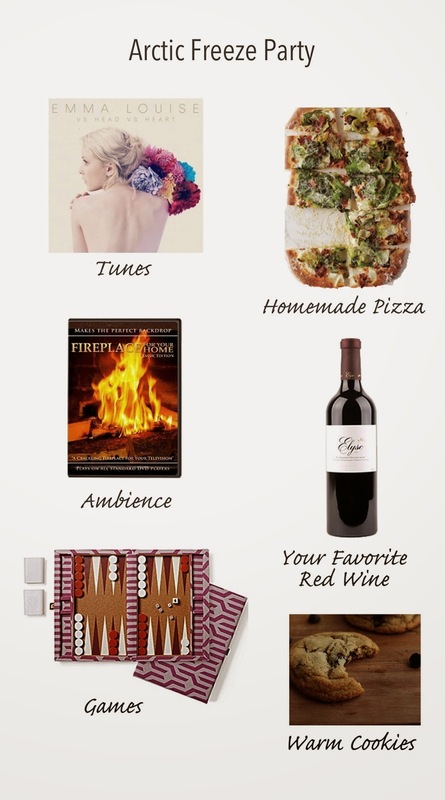 Your Favorite Red Wine Red just seems the coziest option, doesn't it? While we keep a few special bottles tucked away for a snowy day (the one pictured is Elyse Winery), you definitely don't want to plow through all your nice wine in one night. This year we started buying what we now refer to as our "house red" by the case. Domaine Brunet Pinot Noir, an already affordable French red, is even more affordable with a case discount. So we don't feel guilty if we open several in one night. The next time you find a reasonably priced bottle that you really love, buy a case of it! There is zero chance it will go to waste and you'll thank yourself later. Games Everyone has their own favorites, and I would love to hear yours! I'm always on the look out for new board games. My standby is Taboo, but Cards Against Humanity has taken over for the past year or so. In a pinch, Heads Up is a fun game that is available via an iPhone app. Warm Cookies No one will be able to resist warm cookies from the oven, and everyone will love you for them. You can make the dough days in advance if you hear of a storm coming on, or even months in advance if you freeze it. Here are 3 of my favorite cold-month cookie recipes from yesterday's post. Has anyone thrown a cozy little house party this winter? I'd love to hear about it!